Predator Hunter Outdoors will be hosting a Predator Kill Photo Contest!! We're going to be running a predator photo contest through September 26, 2013 to all of our fans of the PHO Facebook page who submit 1 or 2 photographs of their best kills! It MUST include YOU in the photo, first and last name, location where it was taken and the WEAPON used! We will choose the TOP 20 photos and post them on our Facebook page by October 1st. HOWEVER, YOU our fans will choose the no. 1 winner! Each week will be run elimination style by eliminating 5 photos a week. That is 20, 15, 10, 5, WINNER! 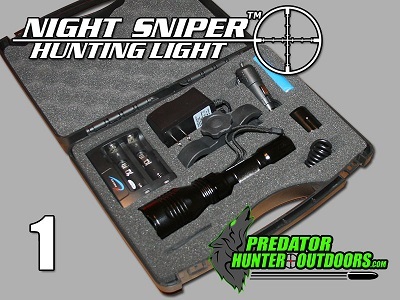 The winner of the contest will win a Class-1 Night Sniper Hunting Light Kit! A $125.99 + Shipping value! Your photos can be submitted directly to paul@predatorhunteroutdoors.com. Also, your pictures will be featured on our website, as well as, on our Facebook page!! So get to scavenging those photo albums and find the best pictures you've got! We'll be waiting!! !